Walker Foster Solicitors are delighted to announce that Simon Blake has joined their commercial team as part of the firms planned and continued growth. Simon is an experienced employment solicitor and specialises in working with business owners to help them manage their staff effectively and to stop employment law issues distracting them from running their business. 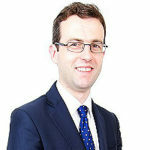 As well as defending employment tribunals on behalf of commercial clients, Simon is able offer up-to-the-minute expertise any aspect of employment law including what an employer should include in its employment contracts and staff handbook to best protect its business, how to organise personnel files to comply with data protection law, how to handle employees who are not performing or are off sick, how to safely dismiss an employee and to safely carry out redundancies. Simon is a member of the Employment Lawyers Association and is a visiting lecturer at BPP Law School. Simon has joined Walker Foster following a merger between Walker Foster and his specialist employment law firm, Simon Blake Solicitor Limited. Walker Foster Solicitors commercial team offer a full range of services including business sale and purchase, commercial contracts, commercial dispute resolution including mediation, property and leases and debt services for clients ranging from sole traders and fledgling companies right through to highly successful SMEs and larger companies. For more information please visit the business services pages on our website.